Considering how important mass ratio is for the rocket equation, why are rockets built still out of aluminium, and not some lighter material, perhaps carbon/glass fiber composites? Wouldn't it be useful to switch to composites? Are there big downsides that make it a no-no, or is it just that it's hard to develop this technology and metal is simpler? Composite materials work well in temperatures commonly encountered in all weathers on Earth, but rocket elements swing between temperatures of liquid hydrogen (where polymer components become very brittle) and thousands of degrees of air resistance and combustion radiation (where composites simply burn), and brutal temperature shifts once in space. Never mind limited durability against UV and space radiation, often worse absolute durability values (better "per gram" but worse "per cc", meaning a bigger rocket with more air resistance), worse chemical resistance (hydrazine, SRB fuels), oxidation in high concentrations of oxygen (that evaporates from low pressure cryofuel tanks), and worse long-term durability (this is not as important actually). They certainly have their place - eg. in interior of manned spacecraft, infrastructure surrounding the launch, prototyping - but currently their characteristics in environments that the craft must withstand during launch and in orbit aren't quite satisfactory. Sometimes though, their shortcomings are simply accepted, e.g. the Shuttle liquid fuel tank, built from a composite of quite thin aluminiu and two kinds of foams, would arrive in space badly scorched in several places, and definitely in a worse condition than before the launch - but still good enough to keep the remainder of the fuel until it's depleted. Edit: added more information on why composites aren't common yet. Most of a rocket's structure consists of LOX and fuel tanks. 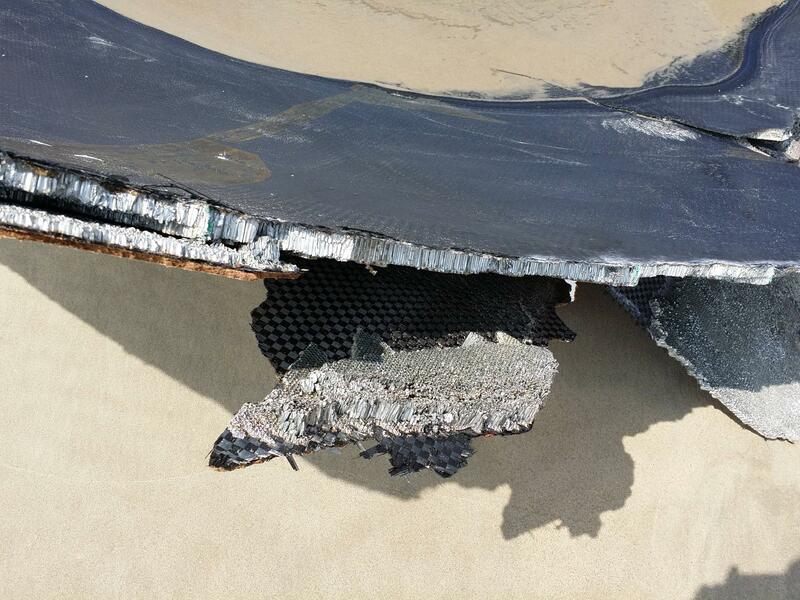 Historically, carbon composites were viewed as too flammable to be used safely for tanks. Carbon composites failed standard tests used by e.g. NASA to determine flammability. In 2001, a study was done to re-examine this decision. To be considered LO2 compatible, materials must be selected that will resist any type of detrimental, combustible reaction when exposed to usage environments. This is traditionally evaluated using a standard set of tests. However, materials that do not pass the standard tests can be shown to be safe for a particular application. This paper documents the approach and results of a joint NASA/Lockheed Martin program to select and verify LO2 compatible composite materials for liquid oxygen fuel tanks. Tom DeLay, a researcher in the area of nonmetallic materials and processes at NASA's Marshall Space Center (Huntsville, Ala.), notes that the many composite cryogenic tank development programs initiated over the years have certainly resulted in technology improvements, yet most had budgetary and schedule constraints that did not permit researchers to identify or qualify the optimum materials for cryogenic environments. Lockheed Martin Space Systems - Michoud Operations (New Orleans, La.) has worked for more than 20 years on various NASA programs to adapt composites for cryogenic applications. Another roadblock in the use of composites is the need for giant autoclaves if you want to build large structures out of a composite (e.g. the SLS tanks). Developing a new rocket is a long and expensive process. The lack of price pressure meant companies could afford to keep using existing designs instead of having to develop new, cheaper rockets. The rocket market is far less cutthroat than the aviation market, and far smaller (so your expensive development has to be paid for by fewer sales). With the arrival of several commercial ventures, that is changing. These days, composites are being considered by NASA, ESA and JAXA for interstage structures, cryogenic fuel tanks and other rocket parts. The Falcon vehicles’ interstage, which connects the first and second stages, is a composite structure consisting of an aluminum honeycomb core surrounded by carbon fiber face sheet plies. The interstage is fixed to the forward end of the first-stage tank. ULA uses the same combination for their Atlas V fairing. 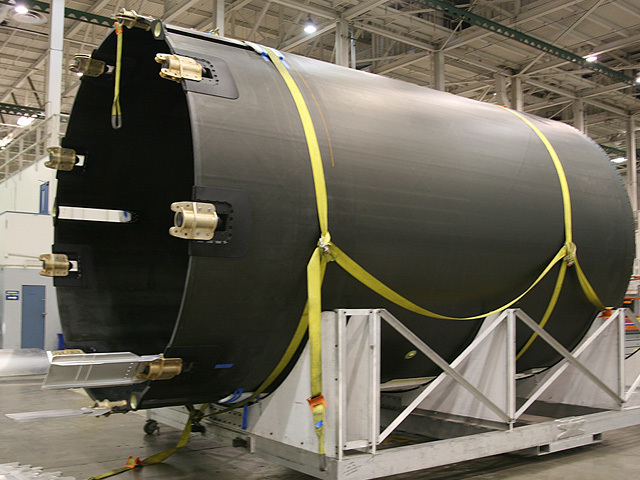 The Atlas SRBs use a carbon-fiber casing. However, instead of the steel outer structure used for the Ariane boosters, the P80 has a lightweight, filament-wound composite casing. It also incorporates a new, simplified design of igniter with a carbon fibre structure. A new, steerable nozzle fabricated from composite material has been developed, with a simplified architecture made up of fewer elements, to reduce production costs. It also includes complex-formed cast metal parts and a new thermal insulation material. ELV are aiming to develop a larger first stage, the P120, to upgrade Vega. These are also expected to be used as the Ariane 6 boosters. As to why these materials aren't used more already, remember that the technology is relatively new (at least for use in such demanding applications as rocketry, as described in SF's answer) and the launcher industry is fairly conservative and evolves slowly. Composites work fine in space, and for cryogenic fuels. There was some trouble with the X-33's liquid hydrogen tanks which is why people say they "don't work at cold temperatures" but those problems have long been resolved. Making them radiation resistant is a matter of selecting the right resin, and resins that hold up in space are available. Of course, rockets only operate in space for a few days at most, so this wouldn't be a factor in any case. The idea that composites are less corrosion resistant than aluminum is absurd, because almost anything is more corrosion resistant than aluminum. Corrosion resistance is actually one of the main selling points of composites. Composites are used extensively in modern satellites to store propellents, among other things. The reason they aren't used in rockets is simple: even the newest rockets (like the Falcon 9) were designed before composites were proven to be able to hold cryogenic propellents. Switching to a new material for the fuel tanks of the rocket would require them to re-qualify the rocket, which takes years and is very expensive. You can expect rockets to begin using these materials for fuel tanks as new rockets are developed in the coming years and decades. Rocket Lab's Electron launch vehicle is (as far as I know) constructed almost completely from carbon composite including the fuel tanks. I hear there have been issues with carbon composites being suitable for holding liquid propellants but if this company is confident enough to produce a vehicle entirely of the stuff then I'm sure they've done their homework. Not the answer you're looking for? Browse other questions tagged rockets materials composite-materials or ask your own question. Does Mars contain materials that could be used to build a space colony? How composite materials used in space tech?